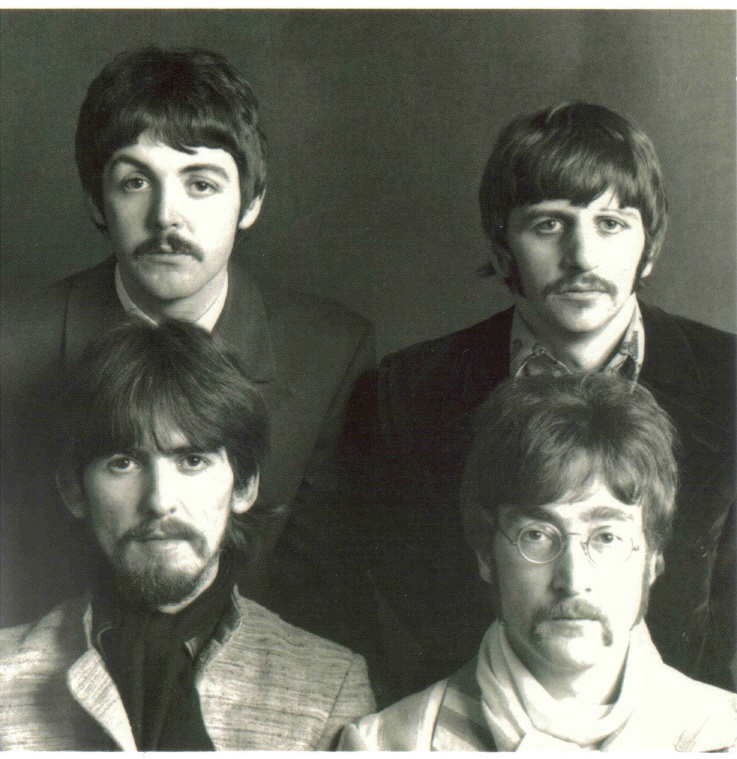 The Beatles Collection » Contract pressings. Sometimes EMI had problems to press enough records to keep up with the demand. 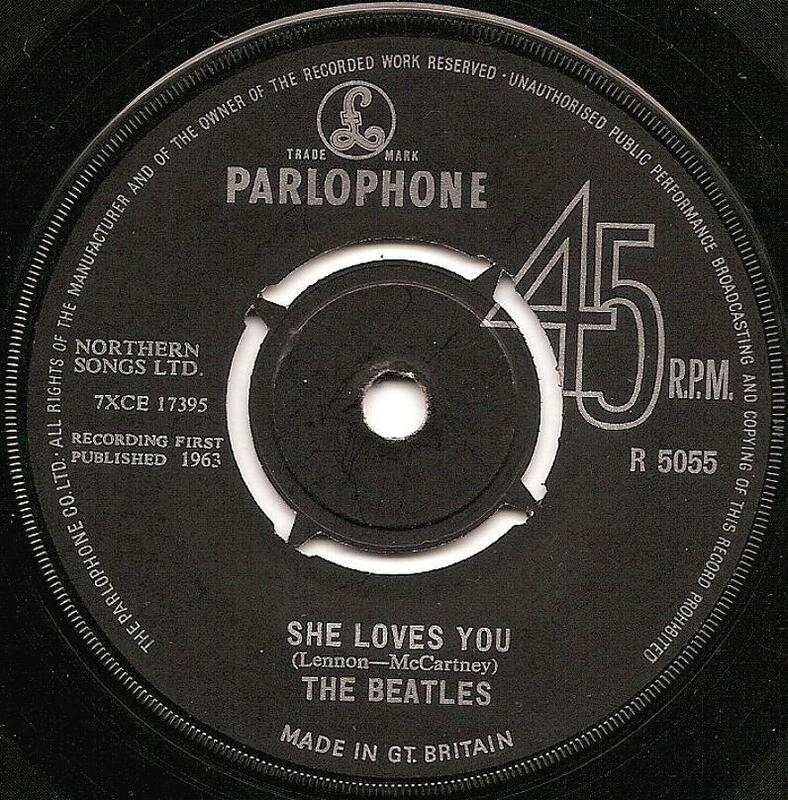 To increase production they turned to other companies to press up some copies of a particular release, however, the majority of copies were pressed by EMI themselves. 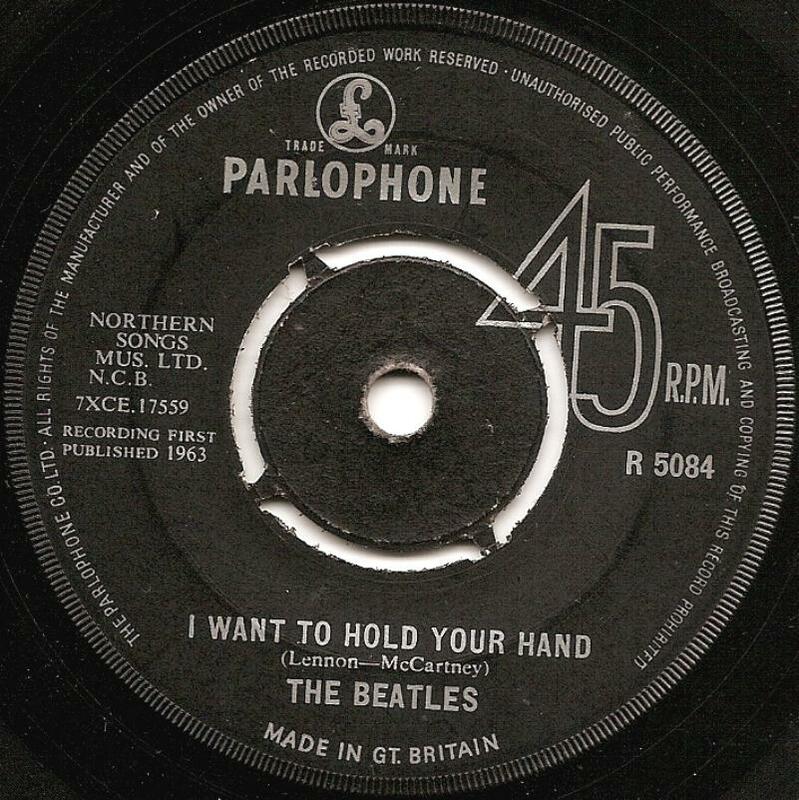 Pressed by Oriole: “I Want To Hold Your Hand”, R 5084; “Can’t Buy Me Love”, R 5114. 1. No tax code is evident in the push-out centre on either side of the disc. 2. The push-out centre has a rough texture to it. 3. There is one small ridge that’s approximately 0.5mm in from the edge of the push-out centre. 4. The gap between the push-out centre and the body of the disc is approximately 2.5mm wide. 5. The tax code can be found stamped into the deadwax at the 9 o’clock position. 6. The mother plate number is pressed directly underneath the tax code at the 9 o’clock position. 8. There are no stramper code letters stamped into the deadwax at the 3 o’clock position. 9. The dinking around the edge of the label is twice the size of the EMI press at 2mm tall. The vinyl for these pressings is thicker and heavier than EMI or Decca pressings. 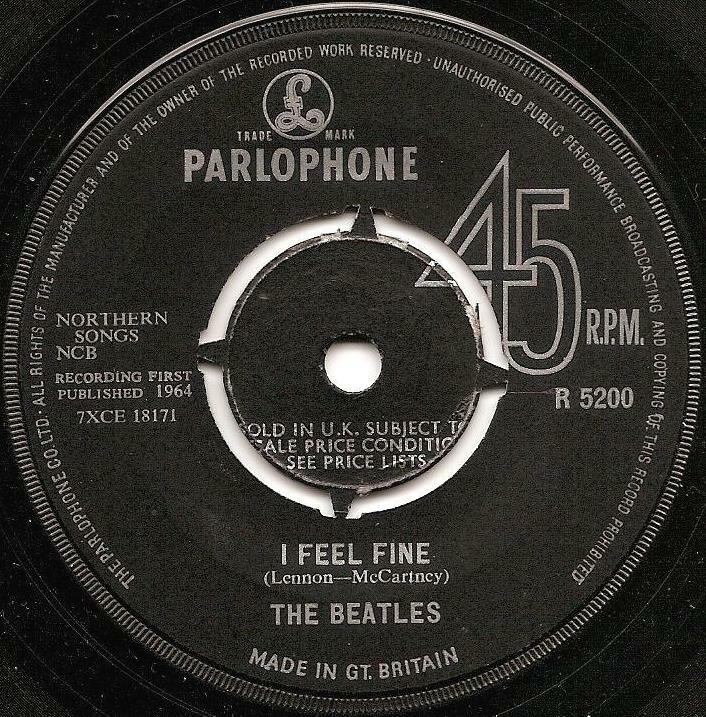 Pressed by CBS / Oriole: “I Feel Fine”, R 5200; “Hey Jude”, R 5722 (see Apple singles). 2. The ridge is approximately 12.5mm out from the centre hole. 3. The gap between the push-out center and the body of the disc is approximately 2.5mm. 4. There is an outer ring on the very edge of the label (which, as a whole, is textured) that runs from the edge to just 2-3mm in. This is the only smooth part of the label. This outer ring has been highlighted in the close-up underneath. 7. There are no stamper code letters stamped into the deadwax at the 3 o’clock position. 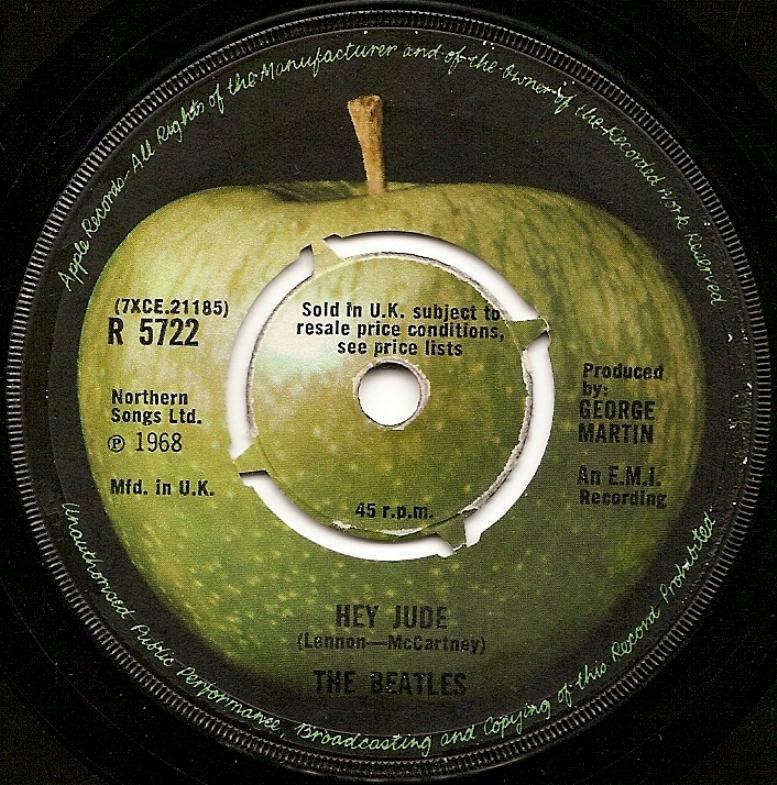 Pressed by Decca: “She Loves You”, R 5055; “I Want To Hold Your Hand”, R 5084; “I Feel Fine”, R 5200; “Help”, R 5305; “Hello Goodbye”, R 5655; “Hey Jude”, R 5722 (see Apple singles). 2. The ridge is approximately 2.5mm in from the edge of the push-out centre, or 10mm from the center hole. 3. There is a second lighter ridge that is approximately 0.5mm in from the edge of the push-out centre. 5. The tax code on every Decca contract pressing can be found at the 12 o’clock position. ‘I Want To Hold Your Hand’ however has the tax code pressed at the 9 o’clock position. 6. The mother plate number (either single or double figured) is pressed directly underneath the tax code at the 9 o’clock position. However, one or two very rare Decca presses have been discovered that omit this number. 7. 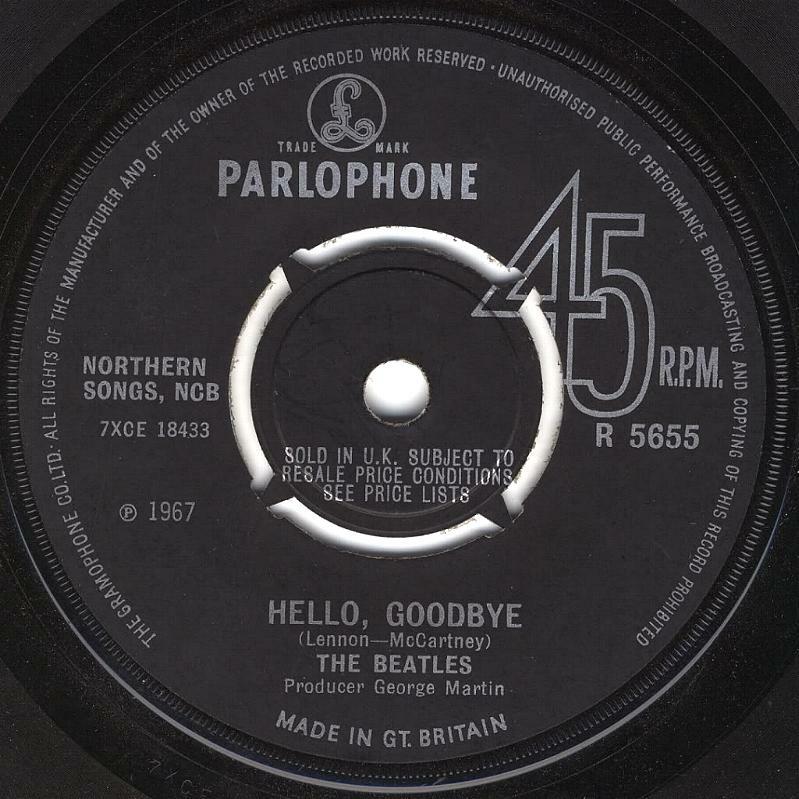 The contract pressings did NOT utilise the BUCKINGHAM stamper codes, so there are no such letters at the 3 o’clock position. 8. The matrix number can be found at the 6 o’clock position. 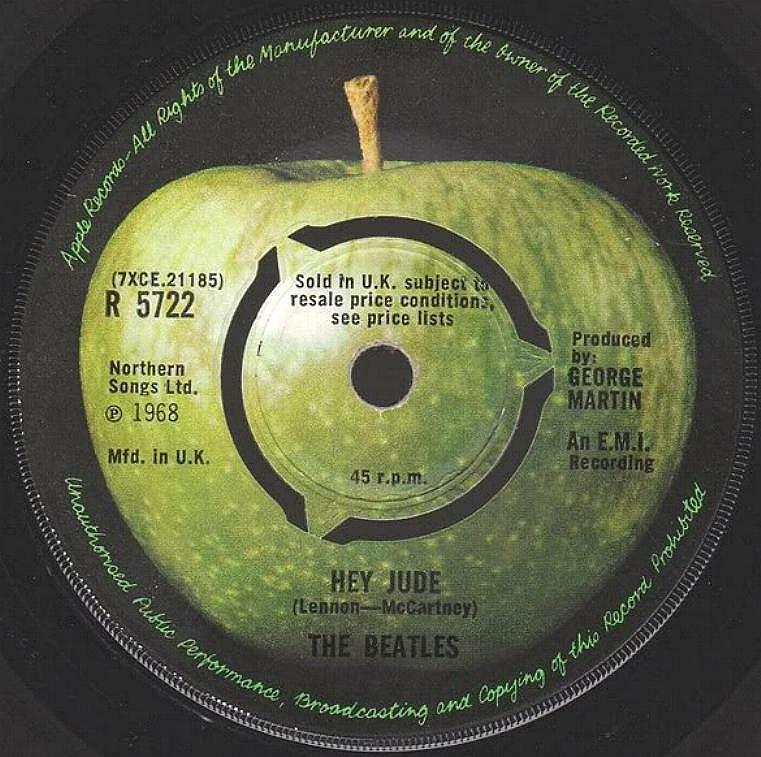 Pressed by Philips: “Hey Jude”, R 5722 (see Apple singles). 1. There is no tax code is evident in the push-out centre on either side of the disc. 2. There is a double ridge (1mm apart) that runs around approximately 1mm in from the edge of the pushout centre. It’s 11mm out from the centre hole and approximately 28mm in from the edge of the label. 3. The gap between the push-out centre and the body of the disc is approximately 2.5mm. 4. The tax code can be found at the 12 o’clock position. 5. The mother plate number (either single or double figured) can be found at the 9 o’clock position. 6. There are no stamper code letters stamped into the deadwax at the 3 o’clock position. 7. The matrix number can be found at the 6 o’clock position. 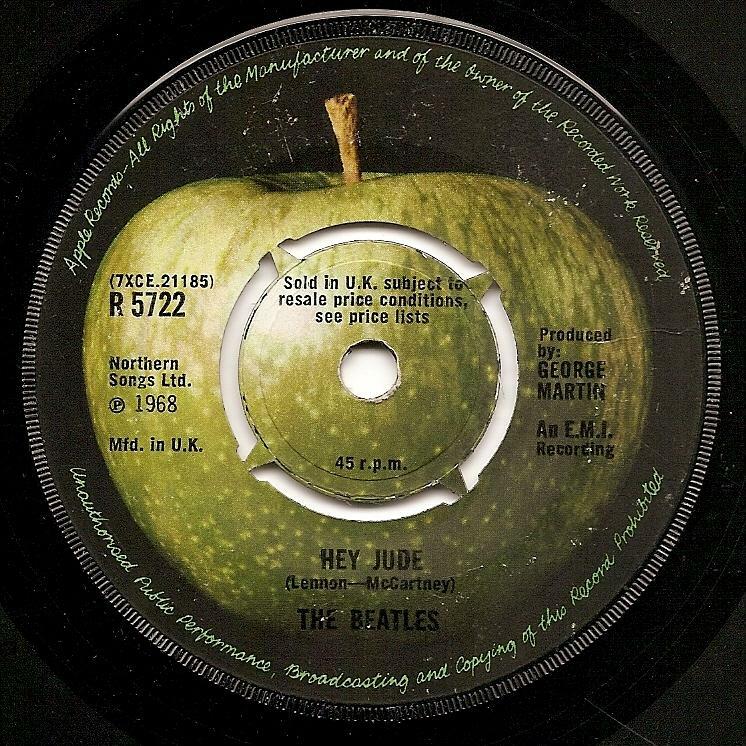 Pressed by Pye: “Hey Jude”, R 5722 (see Apple singles). P.S. 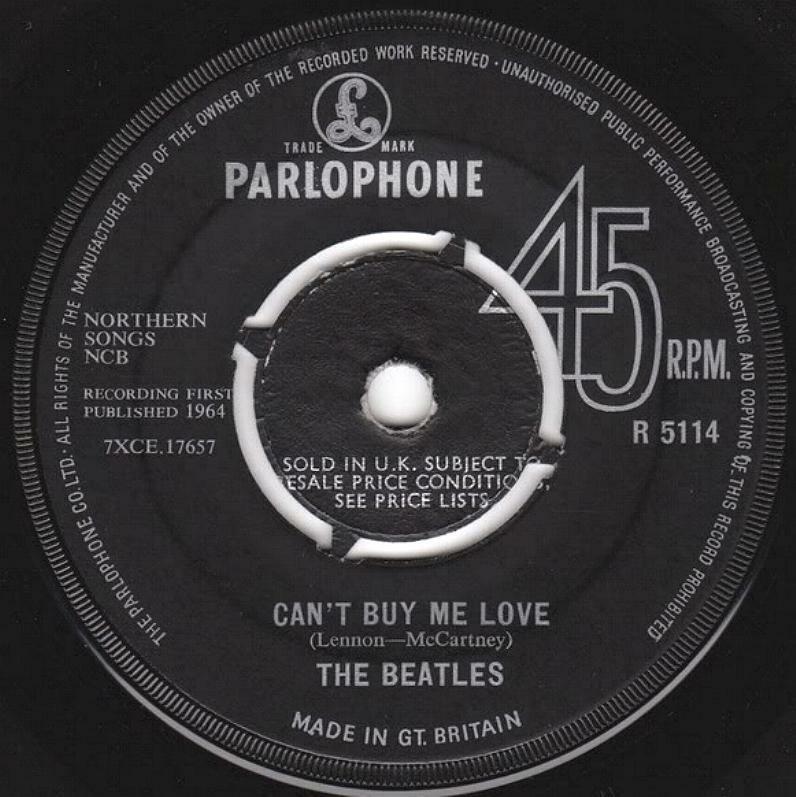 All EMI singles with solid centers pressed before 1966 are contract pressings.